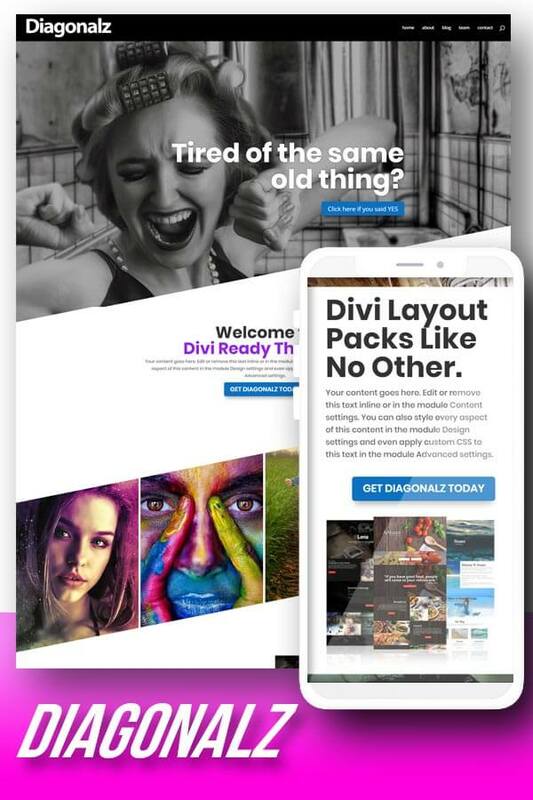 A brand new, exclusive Divi Layout Pack from Divi Ready Themes! Diagonalz will have you looking at design from a whole new perspective. Fantastic, diagonal design, packed with royalty-free images. Unique elements & fully responsive styles throughout! This child theme requires the Divi Framework by Elegant Themes, which must be purchased separately. Standard License: A standard license comes with 2 licenses (1 for the Development Project, 1 for the Live Project). This license allows an item to be used in a single project for either personal or commercial use by you or on behalf of a client. This product cannot be offered for resale on its own nor as a part of a project. Distribution of source files is not permitted. Unlimited License: An unlimited license allows an item to be used in unlimited projects for either personal or commercial use. This product cannot be offered for resale on its own nor as a part of a project. Distribution of source files is not permitted.